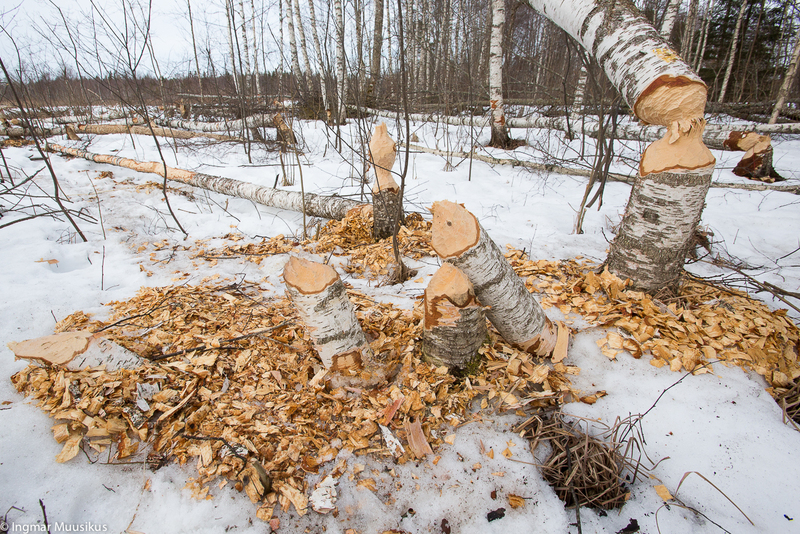 The Esna beavers have felled birches in March 2019. Hundred meter long beaver dams occur rarely in Estonia. One such giant structure was built by the beaver group at the Esna springs. Evidently the dam, dividing the swampy spring area, was ready already in 2017. The hard-working creatures had unknown to themselves made an early symbolic gift for Estonia’s jubilee. By 2019 the landscape view had changed somewhat. In February 2018 the length of the Esna beaver dam could be quite accurately measured on the map of the Estonian Land Board (Maaamet). Altogether it was nearly 100 meters! So that the construction would not be too straight the water builders had made some bends in it. The other end of the barrier disappeared along the water into the birch copse. On measuring the dam in situ with measuring tape it was a little short of 100 metres – the Esna dam length was 95 meters. Esna beaver dam (left) and nest (right) in March 2018. Beavers need a proper dam in order to keep the water at a suitable level. The water level behind the dam must be such that the entrance to the lodge opens under water. However, the water must not rise so much that it would flood the eating area in the lower part of the lodge or the higher sleeping areas. With high water the beavers have a safer access to the food stores and less work with ferrying felled branches to the nest. The northern part of the springs had become a permanent water body after the damming. For its remarkable length the Esna beaver dam had a quite ordinary height – about one meter high. There was no need to build higher. The second outstanding construction by the beavers was a conical three meters high lodge with a diameter of ten meters made of stripped tree trunks, 40 m upstream from the dam. The lodge is large and beautiful but empty at present. Even now at the side of the nest several cubic meters of branches are standing anchored in the bottom mud – the winter food store of the beavers that has not been used. The old nest of the Esna beavers in March 2019. The dry and hot summer of 2018 also disturbed the plans of the Esna beavers. The groundwater level fell drastically. From the springs that provided the little lakelets that had formed behind the dam with water not enough new water came any longer. In the summer heat the water behind the dam evaporated, and the entrance into the lodge was left above water. This was an alarming situation for the beavers. In autumn they moved from their large nest a few hundred meters downstream where the water flows out from the spring area and the Esna river begins. A new dam was placed at the outflow of the water. There a barrier of some meters was sufficient to dam the water. As new lodge an old lodge next to the new dam was taken in use. The new nest of the Esna beavers in March 2019.